Our trip to Northumberland presented us with some striking contrasts. We visited Britain’s smallest museum and a bookshop big enough to have an in-house train, contemplated a huge wilderness that was mostly man-made and found a 300-yard walk that took three hours. There was a sense of emptiness that felt alive, of history that felt current and weather that most definitely went to the extremes. Here are the places we visited, plus a couple that Storm Ali forced us to put on the list for next time. 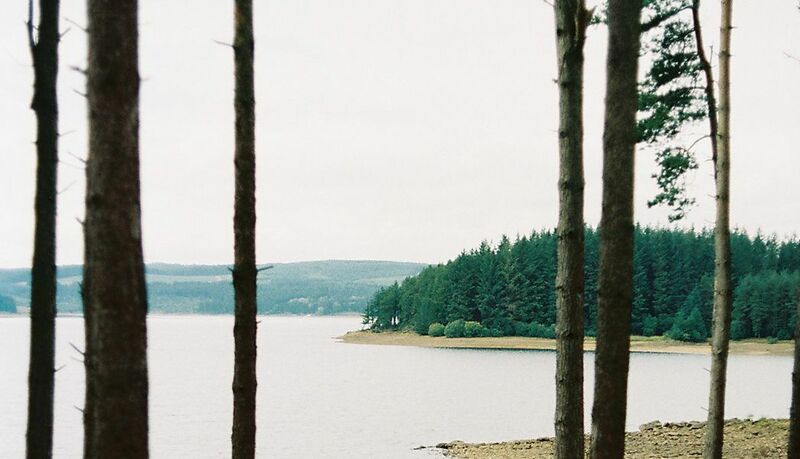 At first glance, Kielder is a pure wilderness of sweeping water and scattered islands. It’s a peaceful place that’s pretty empty even by Northumberland’s tranquil standards, with trails leading through thick woods all around the shore. It was only as we explored further that we came to see how this was nature through a human lens. The woods are plantations (and Europe’s largest forest), ferries help you cut the corners of the longer trails and the lake is in fact the UK’s largest reservoir, built in the late 70s and early 80s. 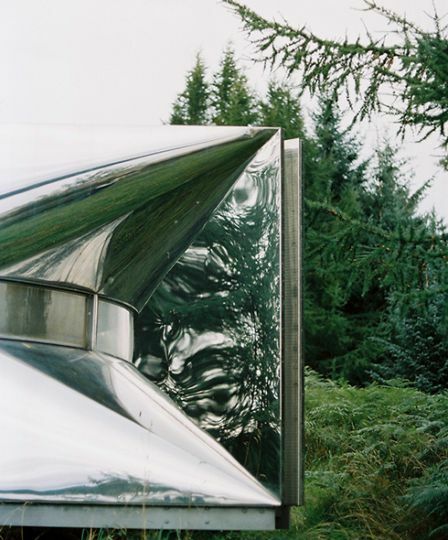 Rather than hide from this though, Kielder celebrates its origins. A series of sculptures, specific to their exact locations around the water, were commissioned from architects to frame the spectacular countryside and inspire thought on man’s relationship with the natural world. It was far more thought-provoking than we’d expected a couple of hours rambling to be, but the area’s other standout feature was on hand to reveal itself as the ideal cure for introspection. Kielder also has the largest Dark Sky reserve in Europe, with a protected area of 580 square miles, making it a perfect home for the eye-catching, angular span of the Kielder Observatory. At one of their night sky events, we waited as they hand-winched the entire building’s roof to point the huge telescope at the moon, which makes you feel childishly excited if you’re a fan of big kit. Afterwards we were told about the “overview effect”, the shift in perspective that astronauts get looking back on earth from space. Watching film footage zooming ever-out from earth into the milky way and then the galaxy, it was easy to understand what they meant. The next day we moved on from Kielder towards Alnwick and Alnmouth, where we swapped perspective-shifting massiveness for a museum the size of a garden shed. Alnwick is a quaint town of rough stone houses, famed for its castle. While we did head over for a look at the superbly manicured castle gardens and treehouse restaurant, a lot of our time was spent hastily making and executing a rainy day plan, which proved easy with the help of a few locals. 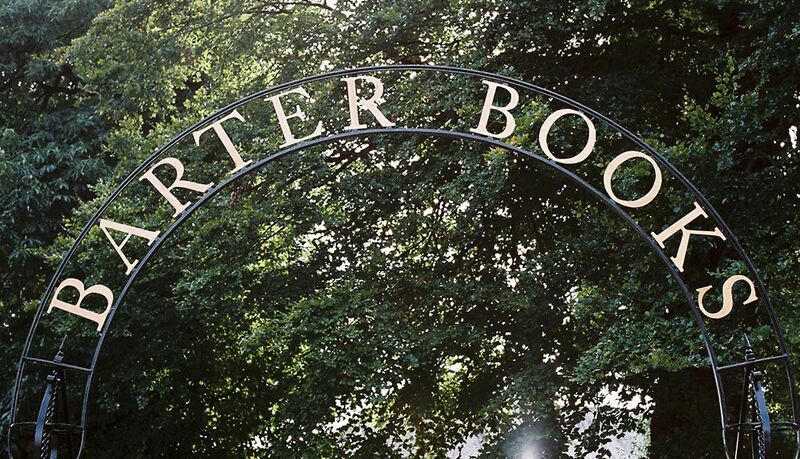 The unanimous recommendation was Barter Books and it was an instant hit with us. Even on a sunny summer day, the place would be brilliant, but when we were sheltering from the weather, it was warm, cosy heaven. The story goes that owner Stuart had a large model railway shop in an old station building and his wife Mary set up a small book stall in the corner. 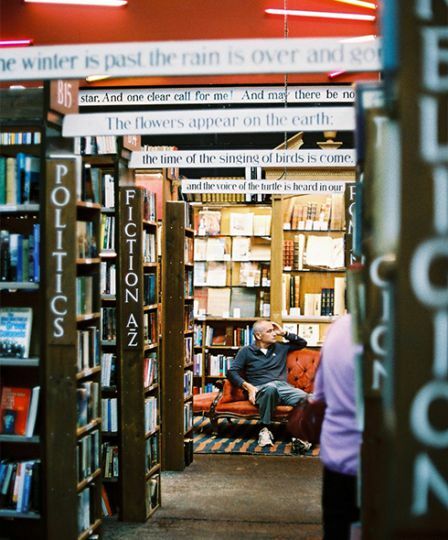 Years later, the books have taken over and the trains have been banished to the beams of the roof, where they rattle overhead as you browse. A children’s playroom, a buffet, and open fires with waiting armchairs turn a simple bookshop into a place to lounge alongside locals and their dogs as you while away an afternoon reading and dozing. Walking around Alnwick’s Bailiffgate Museum with Peter, the volunteer who kindly gave us a tour and chatted about the area’s history, we heard how “Northumberland has so few people it retains much more evidence of historical eras than other places.” It was something we’d noticed as we travelled around, that historical sites seemed to sit side by side as if the county was a giant time capsule. 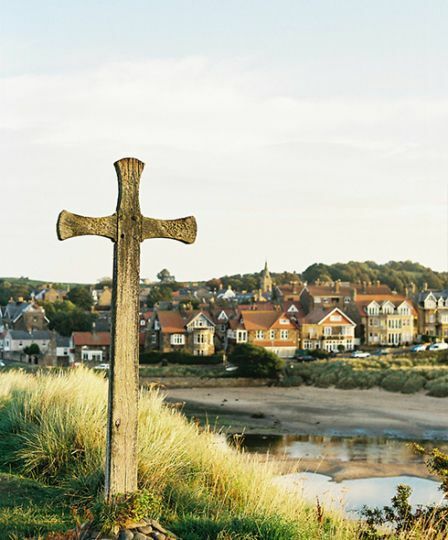 This was also where we spotted a stunning photograph of a cross overlooking Alnmouth, the next stop on our trip, which was such a beautiful view of the town that we’d stubbornly end up walking miles at dawn to see it. 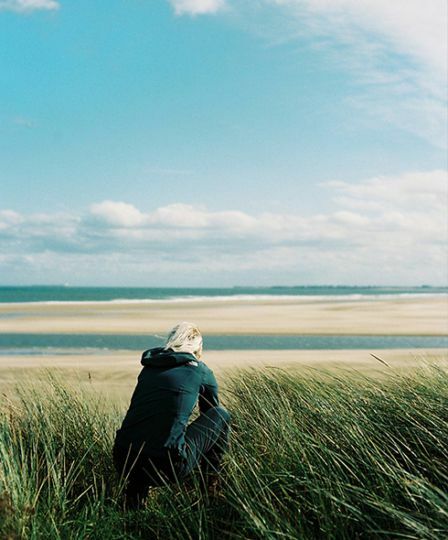 Storm clouds were gathering when we arrived in Alnmouth, but we were still excited by our first glimpse of the Northumberland coast: deep green grass, pale sand, smoky blue water and the river Aln’s sharp curve round the coastal town. We sheltered from the wind in the tiny Ferryman’s Hut Museum, which claims to be Britain’s smallest and definitely feels like it. The walls are covered in local stories and artefacts that paint a detailed picture of the life and history of the area. After taking it all in and squeezing ourselves back out, we retreated to a pub to plan our pursuit of Alnmouth’s famous cross. The cross overlooks the town from Church Hill, named after the ancient parish church of St. Waleric that once stood there. 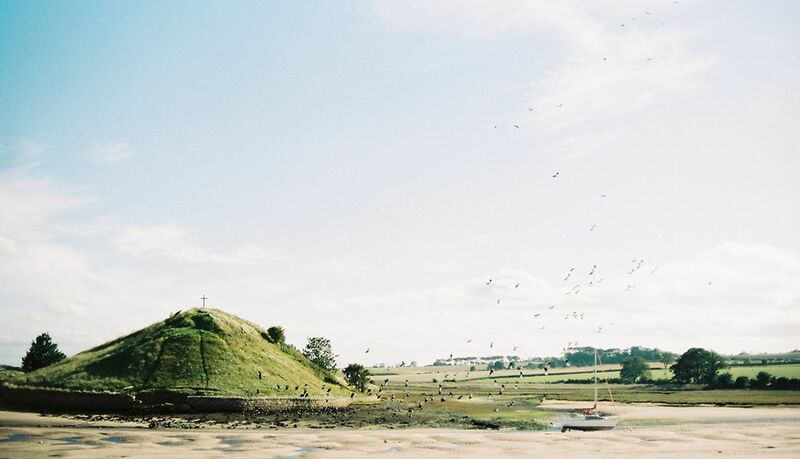 The hill was cut off from the harbour when the river changed course, and the cross sits framed against the sky just a few hundred yards over the water. It looks perfectly reachable, but a short chat with a dog walker revealed that we were in fact on the wrong side of the narrow but deep and extremely muddy river. The only way to get up Church Hill was to drive three miles south to Warkworth and hike back up along the coast, so as to approach on the right side. It is, we discovered, well worth the effort. A pre-dawn departure the next morning set us up for a beautiful sunrise walk along the dunes. 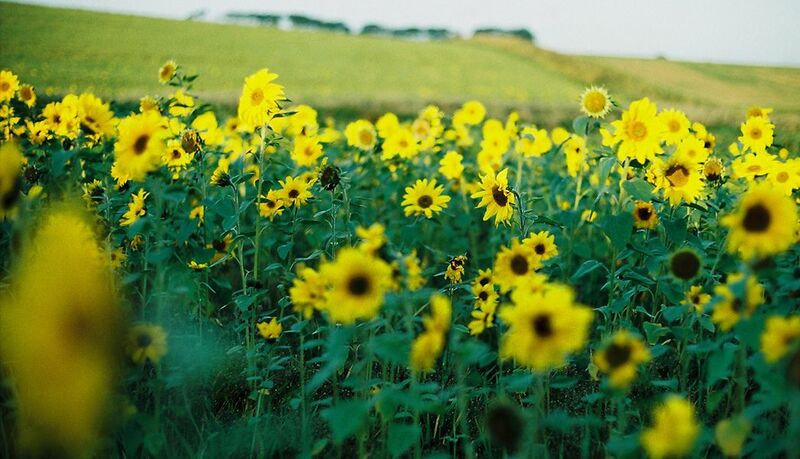 Barn owls were still out hunting, flocks of geese wheeled in practice for a long migration and even when the path dropped briefly out of sight of the sparkling sea, a huge field of sunflowers was there to greet us. It was the most blissful solitude and we did, eventually, find ourselves looking down on the river and the sea from the crest of Church Hill. This perfectly manicured coastal town of clipped green lawns, pretty pubs and well-preserved stonework is dominated by the imposing edifice referred to as, “The King of Castles”. 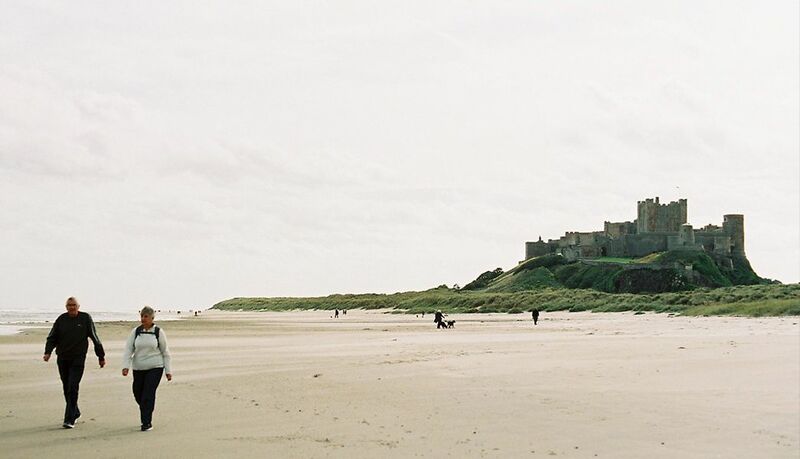 It looms over Bamburgh from any point in the town, but floats alone on a bluff above the sandy coast when viewed from the beach. The core of the castle is a Norman construction dating from the late 11th century and owes its current state to William Armstrong, who bought the place when it had fallen into ruins. Armstrong was a classic example of the eccentric Victorian scientist/engineer/inventor, coming up with a more efficient water wheel design while angling, then developing hydraulic cranes and a business making artillery and naval guns. At enormous expense, he restored much of the castle’s historic glory, although he didn’t live to see the completion of the work. The castle remains in the Armstrong family today, and a museum curator pointed out to us how a castle was still a home, so new residents would shape it to their tastes when they moved in. Thus the clock bell that was originally in the Belle Tower was moved to the chapel by the fourth Lady Armstrong, who was unable to sleep for its chiming. After working up an appetite with a brisk walk on the Bamburgh sands, we returned to town and settled in a corner of the wonderful Potted Lobster restaurant, although sadly our expenses allowance didn’t quite cover a sampling of its eponymous dish. Go to Craster once and you’ll know it with your eyes shut next time you visit. For nearly a century, Robson & Sons have run the smokery that produces the legendary Craster Kipper, and the aroma of wood and rich fish drifts through the little fishing village. After hopping out of the car we took our first breath of lightly smoked air and set off on the short coastal walk to Dunstanburgh Castle. 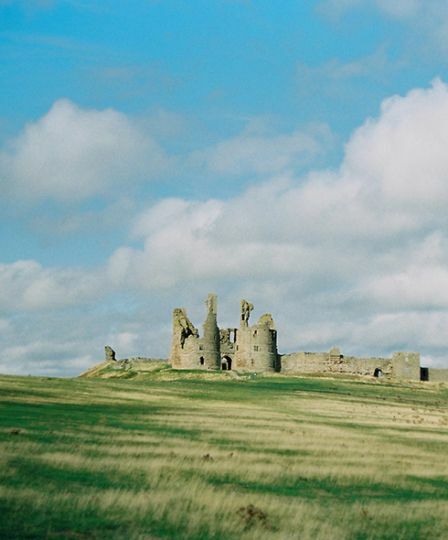 Dunstanburgh, unlike Bamburgh, was never rescued from decay, so the ruins of its towers stand out raggedly on a coastline barer and rockier than at Bamburgh and Alnmouth. In good weather, it’s a level half-hour stroll from the village, but Ali was starting to make itself felt so much we could lean back on the gusting wind. Our compadres on the coast path huddled in twos and threes and dogs looked incredibly unimpressed. Recent archaeology reveals that the castle, a casualty of the War of the Roses, was originally built on a much grander scale, but the crumbling walls against the backdrop of the whitecaps still make a powerful image. On our return to the village, we make the unmissable stop at its other institution, the Jolly Fisherman, Craster’s single pub. We warm up from the wind by their open fire and noticed just the faintest hint of kippers. We saw what we could in our fleeting few days in Northumberland, but time and Storm Ali forced us to leave a couple of things on the list for our next visit. Unsurprisingly, these were both islands rendered inaccessible by the heavy weather. 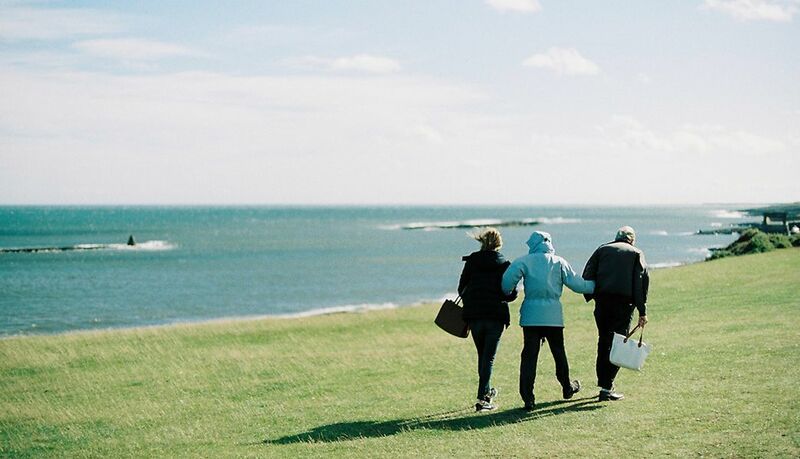 The Farne Islands, just off the coast near Bamburgh, were named by David Attenborough as his favourite wildlife spot in the UK. They are home to a seal colony and numerous bird species including the iconic puffins – we were advised to come back in late June/early July when they breed. 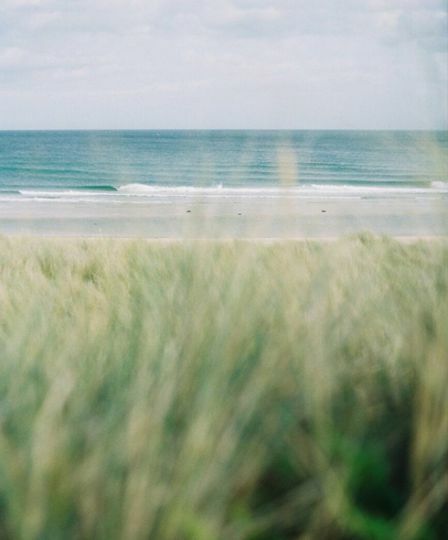 Boat trips leave from nearby town Seahouses, if you’re luckier than we were with the weather. Tide times and bad luck also prevented us from visiting the Holy Island of Lindisfarne. Cut off from the mainland twice a day, the 12th-century priory clings to the slope of a hill near the village of Beal. Check safe crossing times, then head across the causeway to feel the weight of history among the crumbling arches of this important Christian site. William Armstrong, of Bamburgh Castle fame, also owned Cragside House where he gave free rein to his genius and creativity, constructing five lakes, overseeing the planting of millions of trees and making the house the first in the world to run on hydroelectric power. Now owned by the National Trust, we were told that it’s an incredible place to visit. A tour around the grounds and the Electrical Room, where many of his inventions and gadgets have been gathered, gives you a glimpse of what the man known as “The Magician of the North” was capable of. 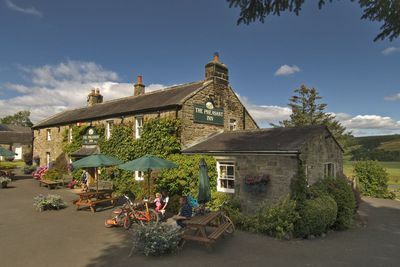 A super little inn lost in beautiful country; with open fires, cosy rooms, local food and the magnificent Northumberland National Park all around. 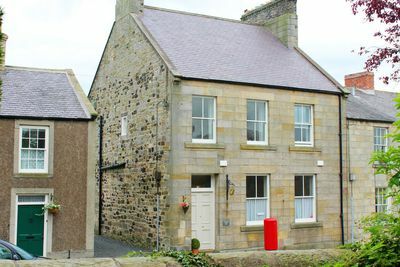 A Victorian post office, now elegant B&B, on the edge of Northumberland National Park. Claire and Simon will look after you well and the breakfasts are perfect for a busy day ahead.